SOIL: Loose, light and free draining, can use a commercial mix with added peat and perlite. Preferably a soil pH of 5.5 to 6.5. 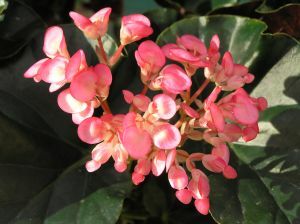 FERTILISING: Begonias will respond to almost any fertiliser, used as the manufacturer recommends. An easy suggestion is some slow release fertiliser applied in spring complemented with weekly liquid or foliar feeds. PESTS AND DISEASE: Occasionally loopers will attack and can be controlled with Carbaryl. Especially in spring, thrips and mites can be a problem and a miticide is needed. In autumn and early spring mildew will attack some varieties, Rexes, semi-tuberous, some canes and shrublike and preventative spraying with a fungicide is necessary. WATERING: No begonia likes to have wet feet. The roots like to "breathe". During our winter if the plants are protected from rain, a good watering every 7 to 10 days is probably sufficient. As the weather warms up in spring/early summer and the plants are actively growing they will require more moisture. During summer, when the plants are larger and transpiration and evaporation increase, many plants will require watering every day. Be careful if using wetting agents. POSITION: Begonias require protection from direct sun and strong winds. Grow under 80% shadecloth, on a protected patio/veranda, or a protected position in the garden. Information Sheets - all files are in PDF format and will open in a new tab or window.